Axing UNRWA: The End of the Beginning? Originally published under the title "The World Must Finally Awaken to the UN Refugee Agency's Failures in the Palestinian Territories." Breaking with his government's longstanding policy, Israeli Prime Minister Benjamin Netanyahu told U.S. Ambassador to the UN Nikki Haley last week that UNRWA should be dismantled. Israeli Prime Minister Benjamin Netanyahu broke from the Government of Israel's longstanding policy and stated that UNRWA, the internationally funded UN body dedicated to providing health, education, welfare and legal services to Palestinian "refugees," should be shut down. This dramatic shift is long overdue in a region where refugee populations have grown enormously but where Palestinians continue to receive overdue attention. Netanyahu's statement, made to U.S. 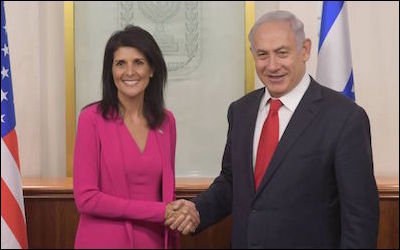 Ambassador to the UN Nikki Haley during her visit to Israel last week, came shortly after the discovery of yet another terror tunnel underneath a UNRWA-run school in Gaza. He followed up with a statement to his cabinet that "the existence of UNRWA — and unfortunately its work from time to time — perpetuates the Palestinian refugee problem rather than solve it. Therefore, the time has come to dismantle UNRWA and merge its components with the [UN] High Commissioner for Refugees." Though Israeli politicians have argued for changing policy toward UNRWA, Netanyahu appears to have finally done so. For decades, Israel supported UNRWA's role in providing aid to Palestinian refugees. For decades, Israeli officials have claimed that without UNRWA providing for the needs of the Palestinian refugees in the West Bank, Israel would be held responsible. This is a burden Israel preferred not to bear, despite UNRWA's well-documented cooptation by terrorist elements from Hamas and other groups. The position produced a perversity in which Israel itself reinforced the very organization whose role includes perpetuating a core tenet in the Palestinian national narrative, the absolute centrality of refugees to the Arab-Israeli conflict and the demand that Israel accept repatriation of their descendants through a "right of return." It does so through its educational curricula for Palestinians and in representations in international forums. UNRWA allows the Palestinian Authority to continue shirking core responsibilities towards its citizens. Understanding the way that UNRWA helps perpetuate the Palestinian refugee problem reveals an entrenched and dysfunctional bureaucracy, accustomed to almost 70 years of international welfare-including over $370 million from the US in 2016. It also sheds light on the subversive dynamic between UNRWA and the Palestinian leadership; the existence of UNRWA allows the Palestinian Authority to continue shirking core responsibilities towards its citizens. At its root, UNRWA effectively argues that — regardless of the reality — all Palestinians are refugees and victims of an Israeli "occupation." The organization has financial and political interests in maintaining this fiction: As long as the Palestinians are refugees, UNRWA is in business. Success is measured by the contributions it receives and prerogatives it assumes. As a case in point, UNRWA released a statement marking the 50th anniversary of the Six Day War stating, "The occupation remains a key obstacle to the realization of a just and lasting solution for the seven-decade-long plight of Palestine refugees, and it continues to be one of the most salient aspects of a historical injustice that has cast a shadow over their lives since 1948." Israel has finally begun to see UNRWA as part of the problem rather than a permanent band-aid. Israel's historic position and ongoing U.S. funding have created a situation that has promoted Palestinian rejectionism, and which does not advance the cause of peace, or U.S. interests in the Middle East. UNRWA learned long ago to wave the bloody shirt, proclaim its formal neutrality and act as unofficial Palestinian spokesman. But with hundreds of thousands of real refugees flooding over the Middle East and Europe, UNRWA's claims, along with those of Palestinian refugees kept in camps by Arab states, ring more and more hollow. If the State of Israel has finally begun to see UNRWA as part of the problem rather than a permanent band-aid, there may be a real chance to remove one problem that has long ensured that conflict will never end. Asaf Romirowsky is a fellow at the Middle East Forum. Alexander H. Joffe, a Shillman-Ginsburg fellow at the Middle East Forum, is a historian and archaeologist. They are co-authors of Religion, Politics and the Origins of Palestine Refugee Relief (Palgrave Macmillan, 2013).